I was one of the privileged few to receive an invite to the Midsummer Nights Feast Gala Dinner featuring Master Chef Ken Hom at Shook! Starhill Gallery recently. Our entertainment for the night included serenades from Jazz artist Atilia and a fashion show by Antoinette featuring Jean Paul Gaultier and P.A.R.O.S.H. Fashion show by Antoinette featuring Jean Paul Gaultier and P.A.R.O.S.H. Pre-dinner bread rolls were aplenty; I was offered two additional rolls which I ate with generous lashings of butter. 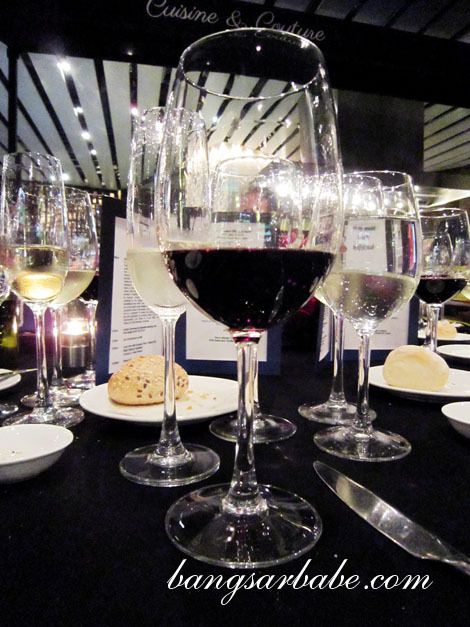 Our glasses were never dry, for the waiter kept topping them with the Torralta Prosecco di Conegliano and subsequently, the Perrin & Fils Côtes du Rhône Reserve. 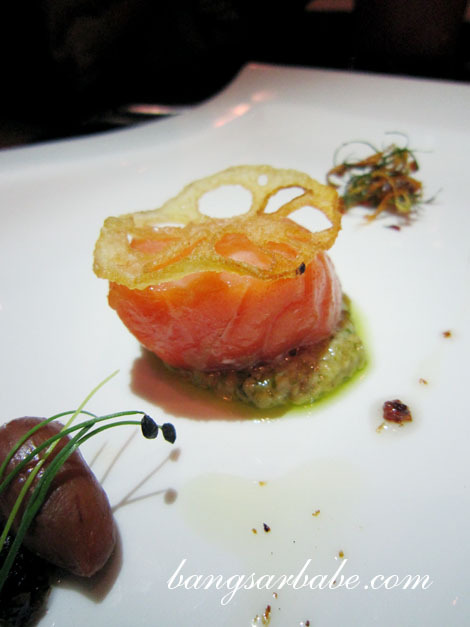 Our amuse bouche of Atlantic salmon tasted bright and vivid with not even a hint of fishiness. 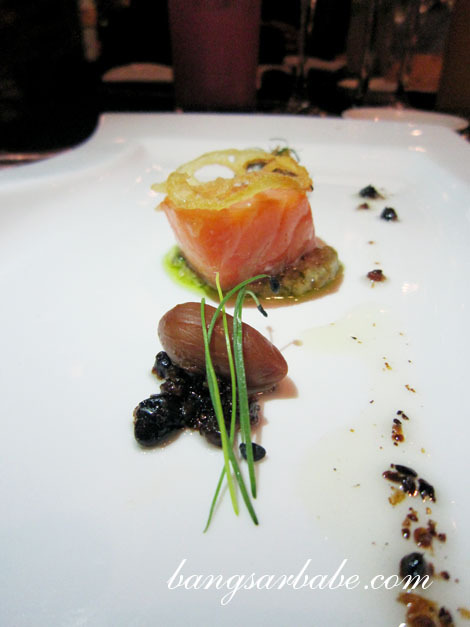 The spring onion sauce was a light and refreshing accompaniment to the buttery-sweet texture of the fish. 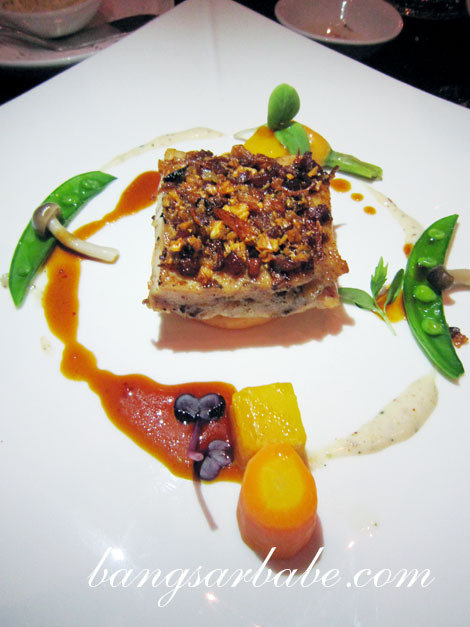 I’ve always enjoyed tuna because of its dense texture and large, generous flakes. One of the simplest and most versatile fish to cook, I was told. Chef Hom’s Marinated Tuna and Avocado Salad was my favourite dish that evening. 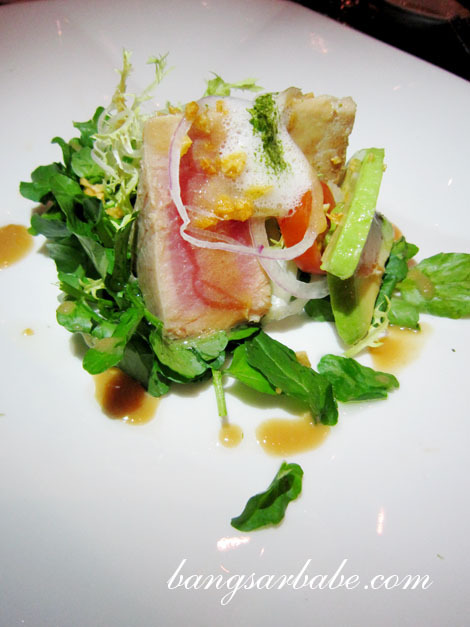 The tuna was firm and moist with a pink centre, and paired beautifully with the creamy-sweet avocado and greens. While the scallops were lusciously sweet and large in size, the spicy Sichuan orange sauce was an acquired taste. My dining companion enjoyed it, but I found this pairing just alright. 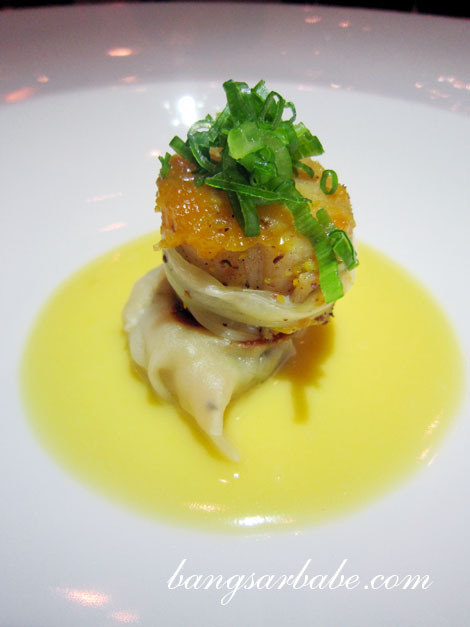 The scallop sat atop a piece of pan-fried dumpling – crisp on one side and lightly chewy on the other. Crispy Crackling Poussin with Garlic and Hot Pepper was a favourite among many. I liked how succulent the chicken thigh was, and the garlic studded skin gave aroma and just enough flavour to the meat. The pumpkin mash was smooth and rich, contrasted by the crunchy vegetables. Portion was however, very small. I could have eaten 4-5 plates of this easily. 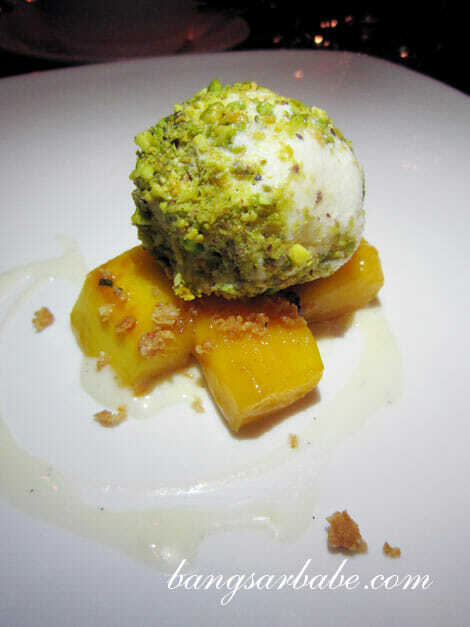 Dessert was a Warm Mango Compote with Basil and Vanilla Ice Cream –subtle, yet the flavours complemented one another. 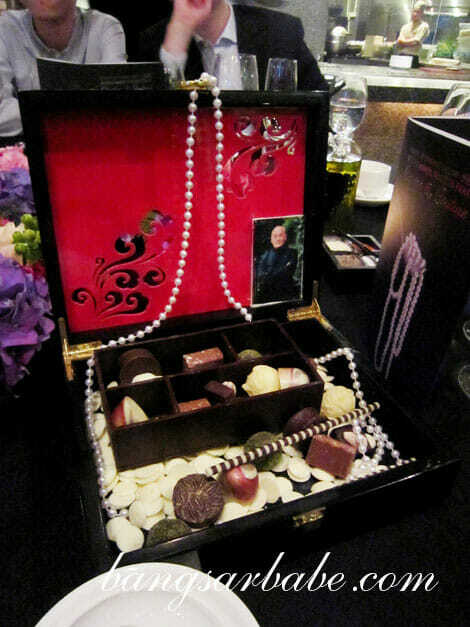 A ‘treasure box’ of chocolates was served to us, much to the excitement of the guest seated next to me. She pounced on the chocolates almost immediately, before I had the chance to snap a picture. During my birthday, i went to this event too hehe. for free cos the bank invited my family. keke. 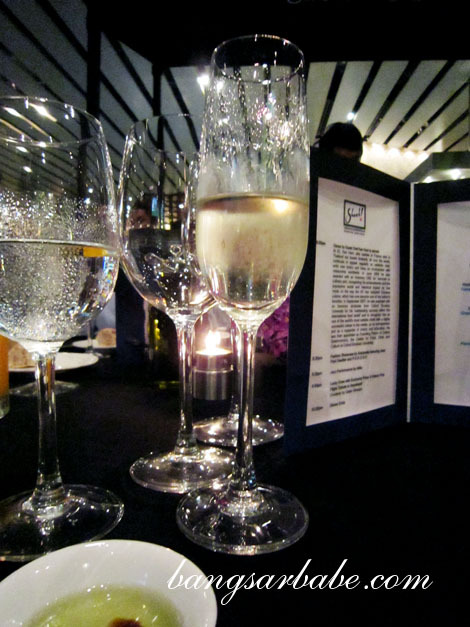 The portions looked kinda tiny though hehehe…but a night of bubbles sounds absolutely fun! But yeah, free flow bubbly is always fun!